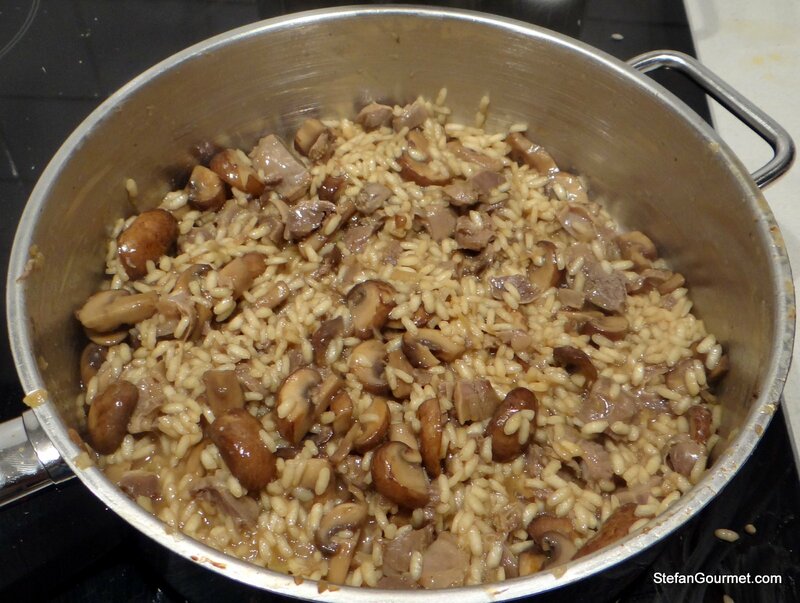 John did not only share the recipe with us, but also a funny anecdote about his mother having to disguise the chicken gizzards as mushrooms so his sibling would eat the risotto. I can imagine that if you see the gizzards you may have the same reaction as John’s sibling. It is part of the reason why this was the first time I used them. Just like other meat, a gizzard is a muscle, which in this case is used by the chicken to grind its food like we use our molars. In this sense the gizzard is more akin to a chicken thigh then it is to a chicken liver. (In Holland chicken gizzards are called “chicken stomachs”.) 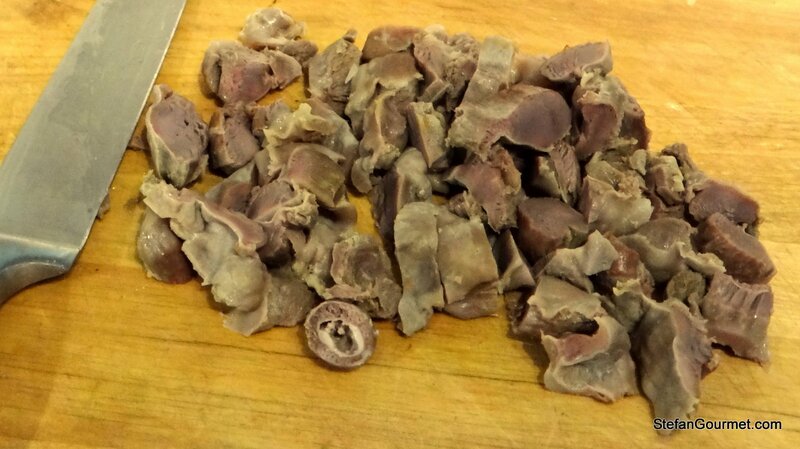 Because gizzards are used a lot throughout the chicken’s life, the gizzards are a tough but flavorful piece of meat. The toughness can be fixed by braising or stewing them, and that is exactly what happens in this recipe. 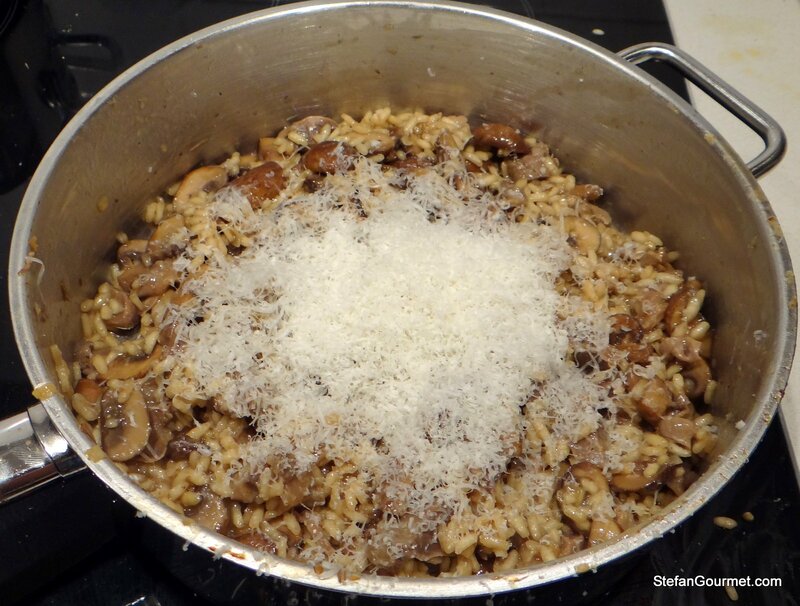 As I wanted to experience what the Bartolini family risotto is like, I followed John’s recipe and resisted the urge to add white wine — this has been the first risotto I’ve ever prepared without adding white wine before adding the stock — as well as to add butter and minced parsley at the end. To save about an hour of time, I parcooked the chicken gizzards in the pressure cooker. 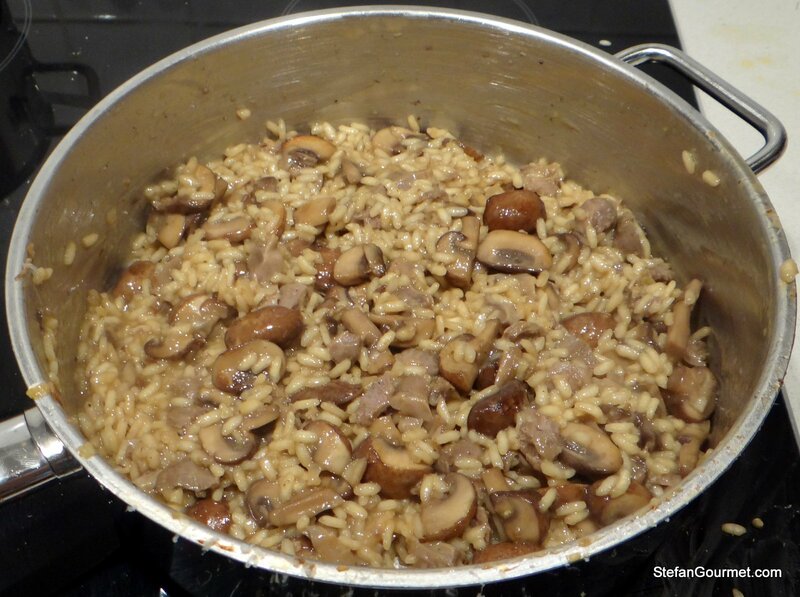 The only other difference is that I used more mushrooms, mostly because they come in 250 grams (9 oz) containers and wanted to use them up. 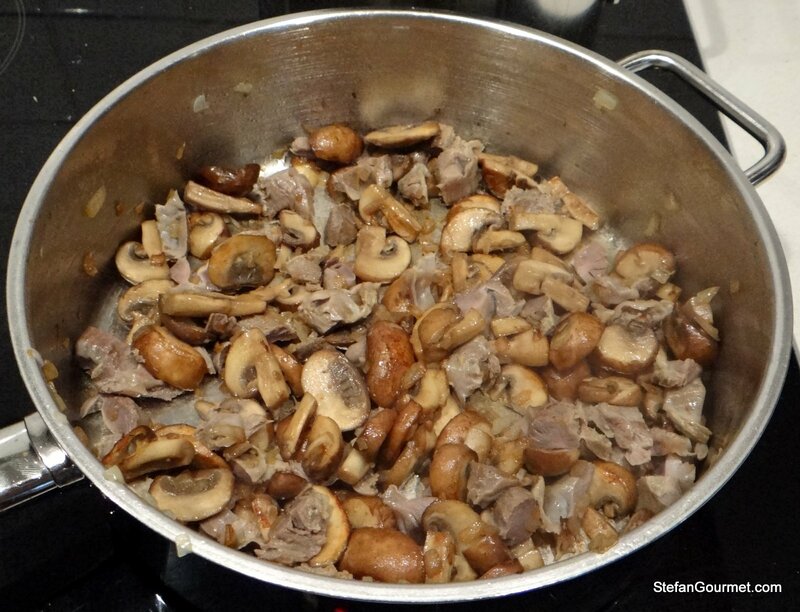 At first it seemed like a lot of mushrooms, but since they shrink quite a bit it ended up being a good ratio of mushrooms to gizzards. 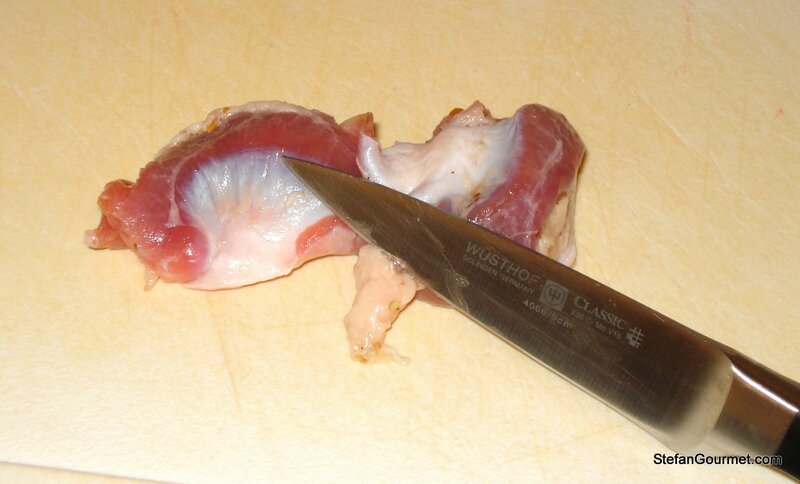 Remove bits of fat or bloody parts from the chicken gizzards. 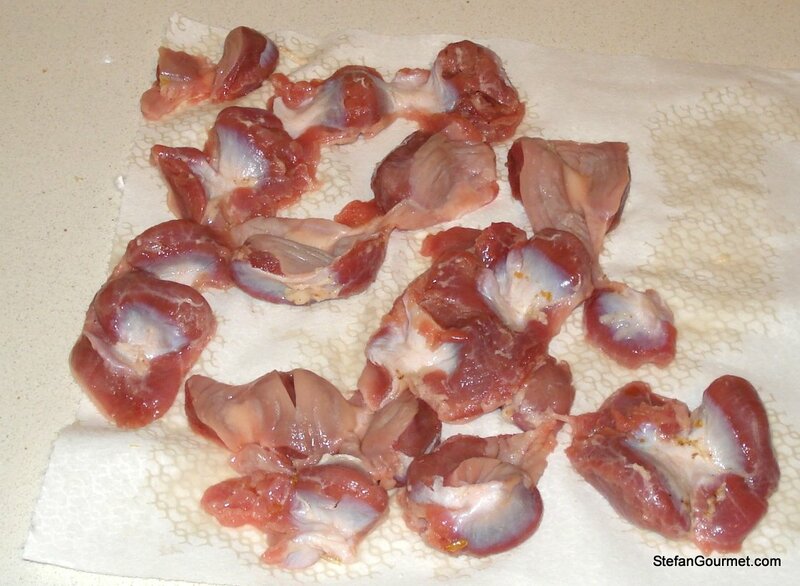 Rinse the chicken gizzards and pat them dry with paper towels. Heat 2 Tbsp clarified butter in a pressure cooker (if using, otherwise a frying pan with a lid), or 1 Tbsp butter and 1 Tbsp olive oil. 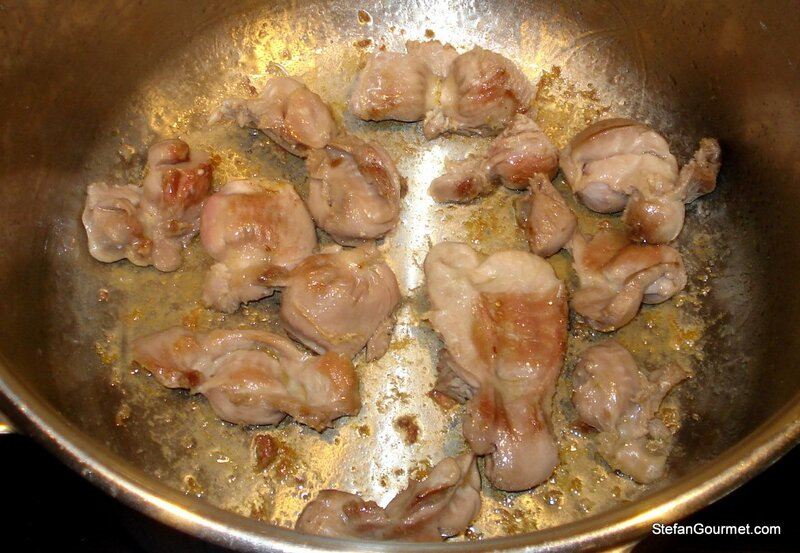 Sauté the chicken gizzards until nicely browned on all sides, 5-10 minutes. Add chopped onion, carrots, and celery, and 500 ml (2 cups) of cold water. 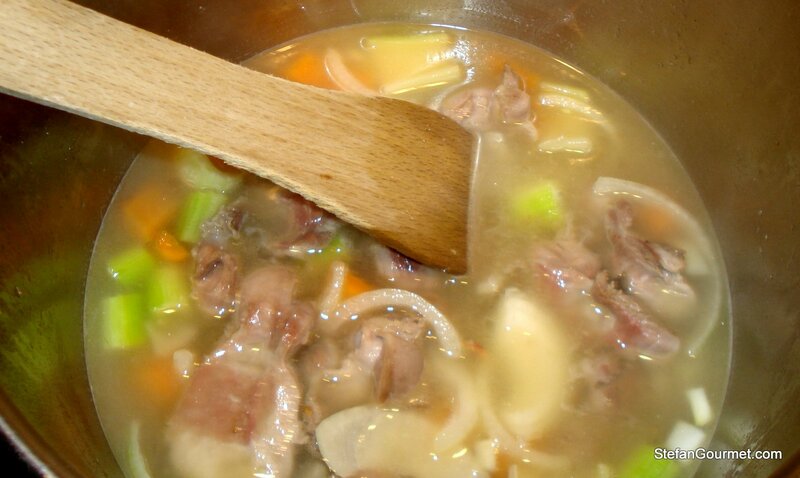 Turn the heat to high and bring to a boil, scraping the bottom with a wooden spatula to include all of the nice browned bits into the stock. Cover and cook for 25 minutes (pressure cooker) or 90 minutes (regular cooking time) or until the gizzards are tender and you will have obtained chicken gizzard stock. Drain the gizzards, catching the stock. 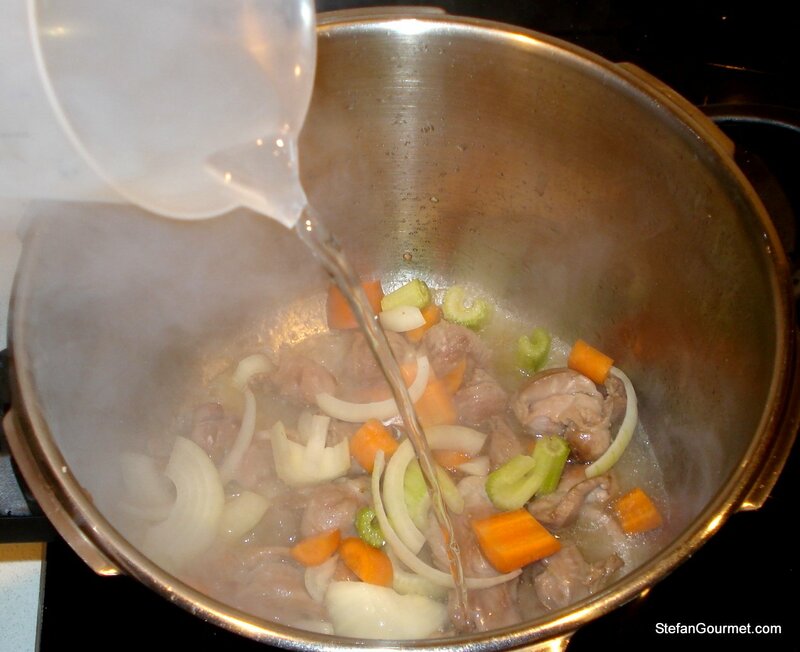 You will have about 400 ml (1 2/3 cup) of gizzard stock. 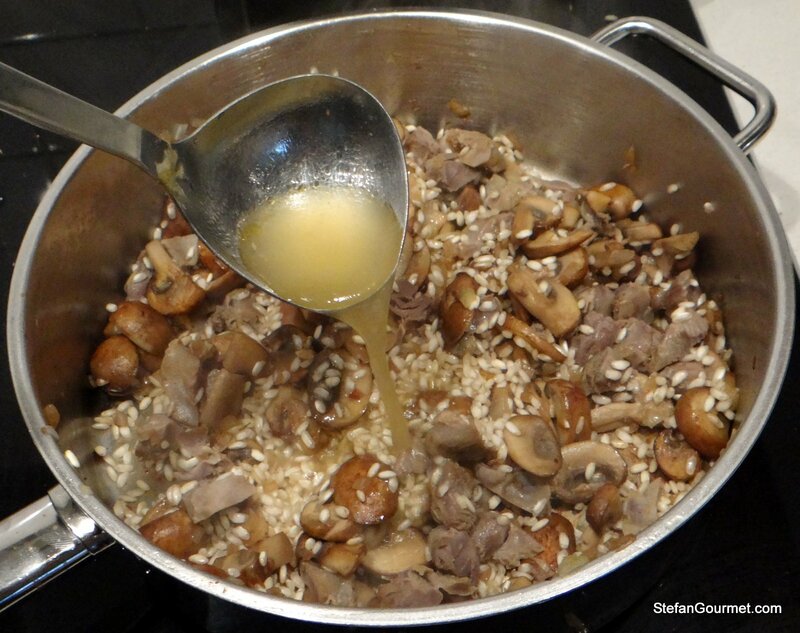 Add chicken stock to obtain about 700 ml (3 cups) of stock to use for the risotto. Keep the stock hot. 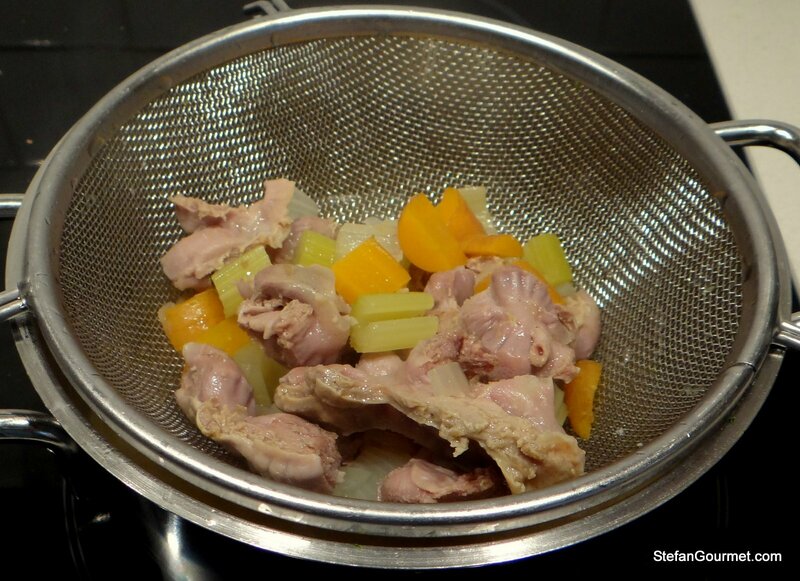 Slice the chicken gizzards into 5 mm (1/4″) slices once they have cooled a bit. 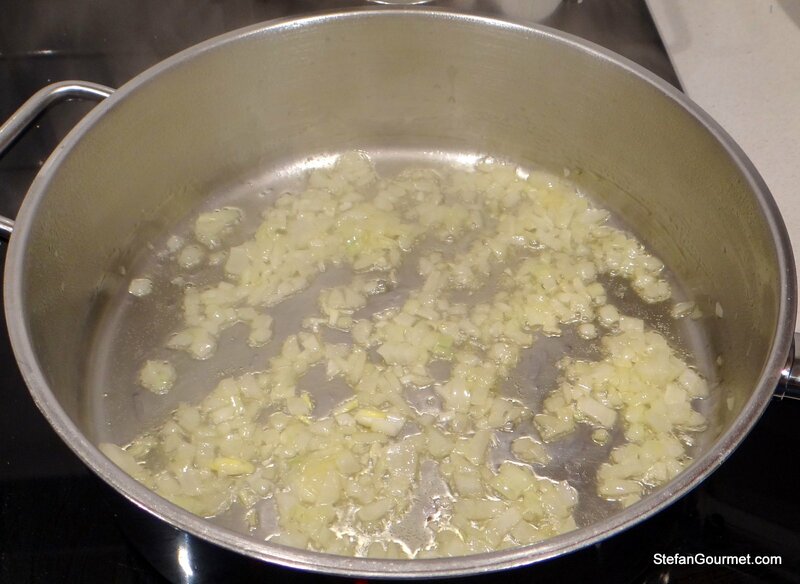 Heat 2 Tbsp butter in a wide thick-bottomed pan and add the minced onion. Sauté over medium heat for a few minutes until the onion becomes translucent. 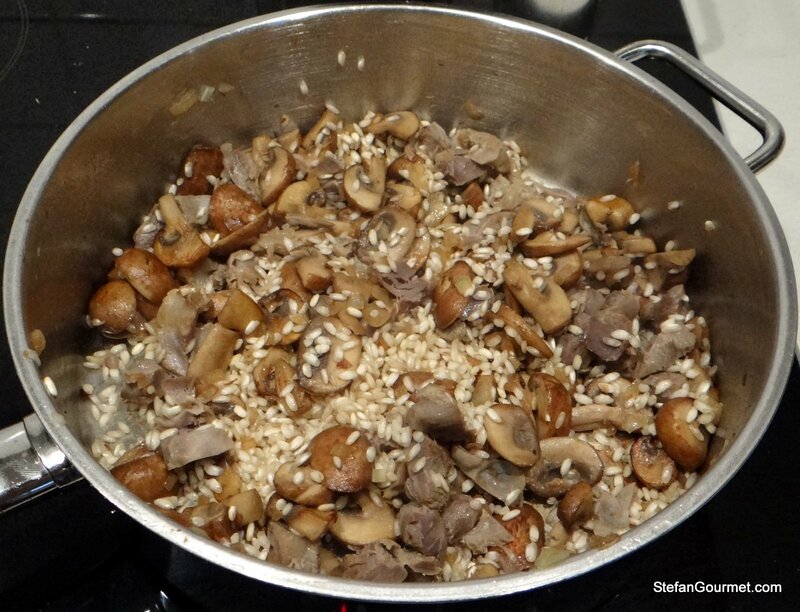 Add the chopped mushrooms and season with a bit of salt. 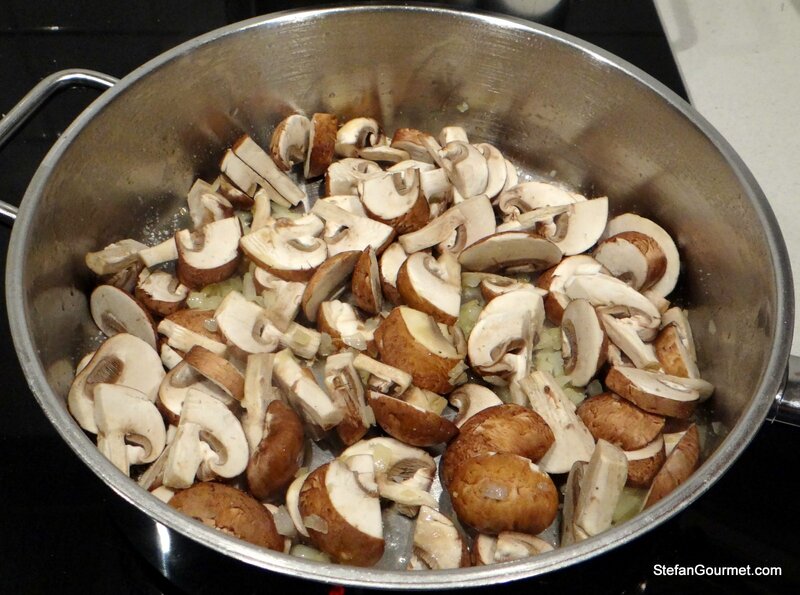 Sauté the mushrooms until they are nicely browned. Then add the chicken gizzards, season with salt and freshly ground black pepper, and stir for a minute until the gizzards have been warmed through. Add the rice, and cook over medium heat, stirring, to toast the rice until the edges become translucent. Resist the urge to add white wine at this point, and add a few ladles of hot stock. 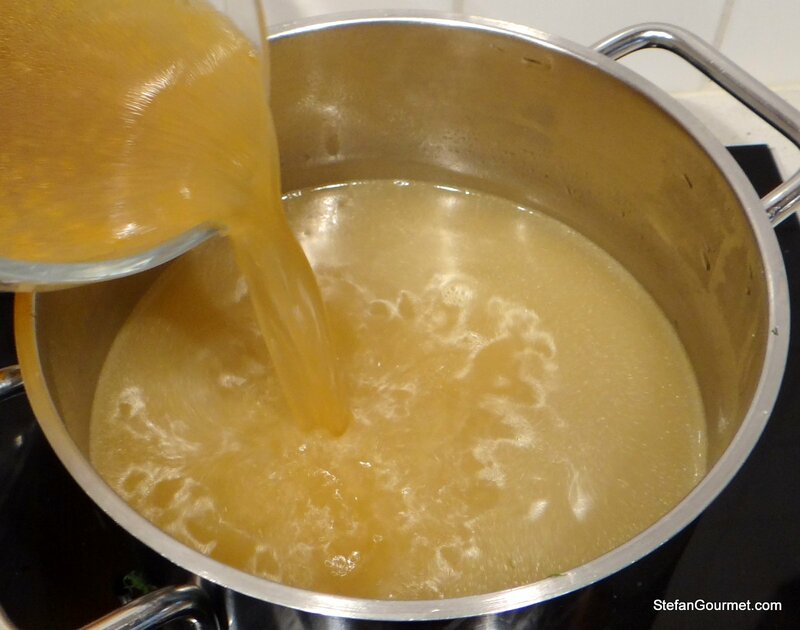 Stir until the rice has absorbed the stock, then add more stock, stir again, etc. until the rice is cooked to your liking and you have probably used up all the stock (about 18 minutes). Add a handful of freshly grated pecorino or parmigiano. Serve on warm plates, sprinkled with some more freshly grated pecorino or parmigiano. 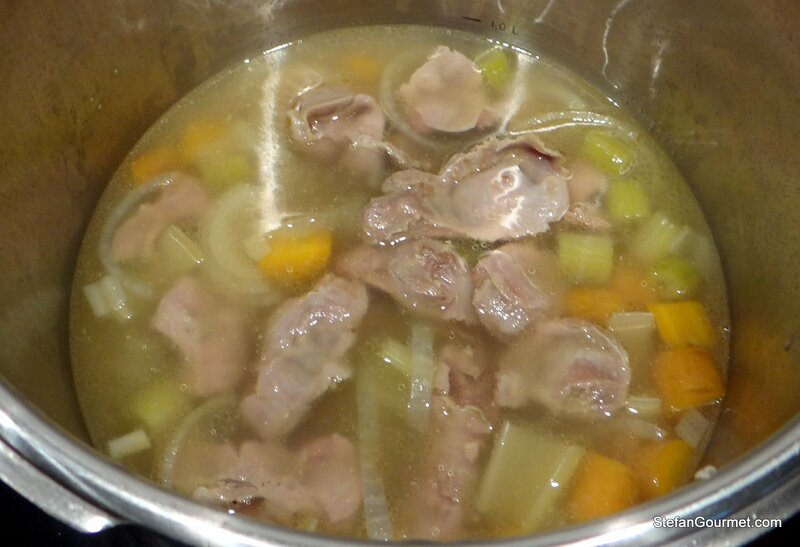 It looks very good and I have to admit I’ve been on the same train of thought and can say I have not cooked any recipes with chicken gizzards- from seeing this post, it is now something worth trying. You have put a big smile on my face, especailly since John is taking that wellearned two-week sabbatical 🙂 ! I too have made and loved this particular recipe, but DID cheat and use wine: and confessed to a laughing John! 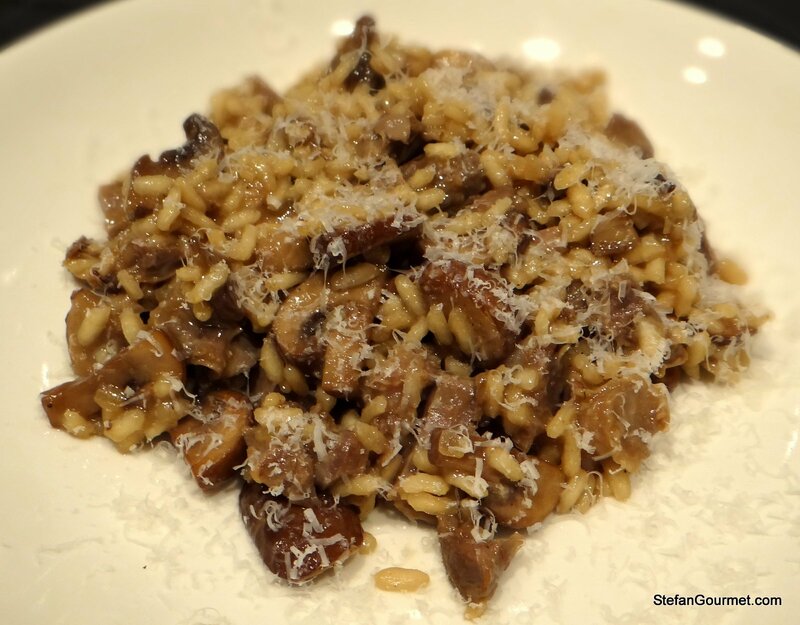 Methinks ’tis a beautifully filling risotto with so much taste! I do use gizzards quite often for just that latter reason! Great to have put a smile on your face, and thanks for letting me know! I will now use chicken gizzards for other purposes as well, and will look for other (traditional Italian) recipes that use them. A great post Stefan. I enjoyed John’s original. The gizzards would need a mushroom description around here too. Looks great, Stefan. I love chicken gizzards and have eaten them most of my life. They are very flavorful and would go well in a risotto. I probably need to give John’s recipe a try. Thank you, too, for your kind words, Stefan. I always feel honored when you take the time to prepare one of our family recipes. The thanks go to Zia and you for sharing the family’s recipe and introducing me to chicken gizzards! I’m really glad Zia was thrilled. My first time to make Risotto and it was perfect. My wife and my daughter loved it. Thank You for great ideas and recipes. i am about to embark on my second attempt to make this dish for some friends tomorrow. I made it about a week ago and it was perfect. Can’t wait to impress my friends from Northern Virgina. Even if they are liberal. It’s not their fault.